Suppose the resistance of a wire is 2 Ω. If the wire is stretched to three times its length, what will be its resistance? Assume that the volume does not change. This is College Physics Answers with Shaun Dychko. Resistance in the first case will be the resistivity multiplied by the first length divided by the first cross-sectional area. We can replace A one with pi times radius one squared. 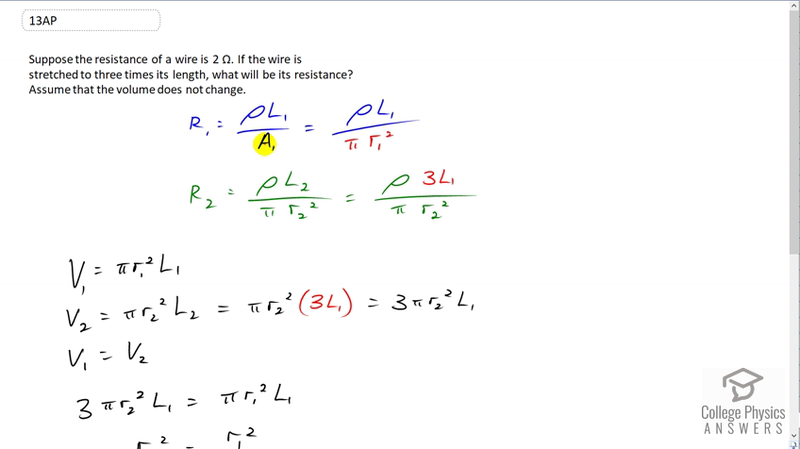 Then we consider the second case where the wire is stretched and it's going to be resistivity which does not need a subscript because it's the same material in both cases, times the new length l two divided by pi times the new radius r two squared. There's a new radius because as the wire is stretched out it's also going to get more thin because the volume is not changing. So it's the same amount of material in both cases but in case two, it's just longer and so it has to have a compensating reduction in its radius in order to extend its length. Now we know that l two is three times l one we're told, it's stretched to three times its length, but we don't know what r two is yet. So let's consider volumes in order to make a relation between r onesquared and r two squared because at this point we can't figure out what r two is in terms of r one. So we know the volume in the first case is pi times r one squared times l one, this is the volume of a cylinder, the cross-sectional area multiplied by its length. In the second case it's pi times radius two squared times l two. Replacing l two with three times l one, we get three pi r two squared times l one is the volume in case two. We're told that the volume doesn't change, v one equals v two. So I didn't even need a subscript on the v's there. So now we can say that this which is here equals volume two, three pi r two squared times l one. Then we can divide both sides by three pi l one and we end up with r twosquared equals r one squared over three. I won't bother taking the square root of both sides because it's r two squared that we care about anyway because that's what's showing up in our formula. So we're going to substitute now in the r two formula with radius two squared. We're going to multiply by its reciprocal because dividing by this thing is the same as multiplying by its reciprocal. So we're going to multiply by three over r one squared, and we end up with three times three making nine times rho times l one over pi r one squared. This is resistance one as we showed up here. So resistance two is going to be nine times resistance one. We're told resistance one is two ohms and so resistance two is 18 ohms.